I have a number of email entries for you today. Great challenge for June, so both Dawn and I have been inspired to create a card. 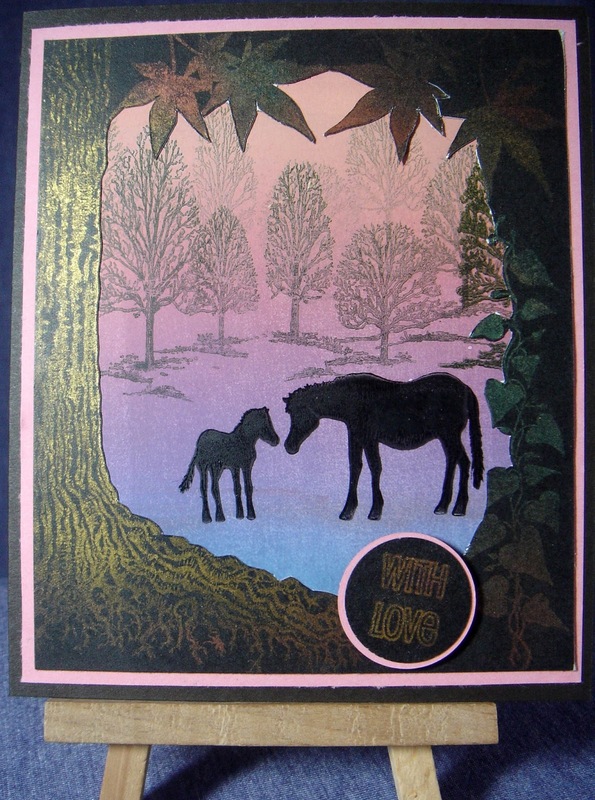 We share all our stamps, so you’ll see that we’ve both used Lavinia’s “horse & foal” silhouette stamp, but our cards are quite different. Dawn brayered her background using a Big & Juicy inkpad, and her forest is an Inkylicious stamp (“The Coppice”). Then she made a frame by stamping Lavinia’s “Tree Root”, “Maple Leaf” and “climbing ivy” in versamark and dusting with perfect pearls in various autumn shades, and cutting to produce the border. 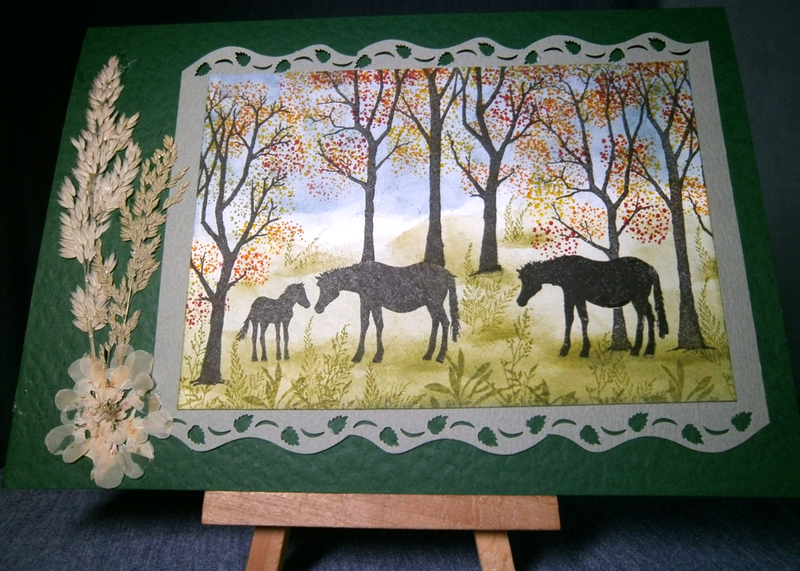 For my horse & foal card, I used Lavinia’s “Spring Trees” to form the forest and I sponged the background, as I don’t seem to get good results with the brayer just lately. The foreground grasses are Clarity stamps. 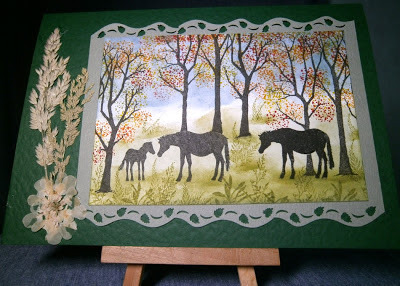 The embellishment is some dried grasses that I collected and pressed myself. To tie in with your theme, we decided to title our cards “new forest ponies” – the New Forest Pony is a breed of pony native to the UK and the New Forest is in Hampshire (southern England). We’re not really sure whether Lavinia’s stamp is really meant to be a New Forest Pony but we’ve decided to apply some artistic licence! My second card (Lonely Stag) uses Clarity’s “Split Tree” and “Small Stag, standing” together with foliage. Hope you like our entries and we’re looking forward to the next challenge. Two more entries! My friend Maureen's deer is obviously not proudly standing in the Texas woods! Although maybe the Piney Woods of East TX??? No, we decided it must have been seen on a trip to cooler parts of the country! 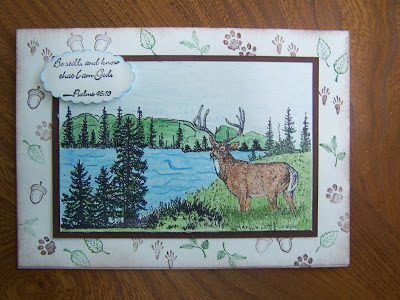 She used stamps from Stampin' Up, and Prisma Color pencils. Near Weatherford, "forest" is synonymous to "impenetrable green wall"! Oaks and other deciduous trees, overgrown with vines... Poison Ivy, tarantulas and copper heads, along with mosquitoes, will certainly keep people away... We are in the third year of a drought, and on short road trip last week I "studied" the woods along the interstate - as well as one can observe while flying by at 65 miles per hour! And I saw that the lack of rain has thinned the "wall", and in places, it was like looking into dimly lit rooms just beyond the edge of the forest... A perfect place for a fawn to patiently wait... The oak tree, oval frame, bell flowers, and bird are from Art Impressions, the fawn is from Embossing Arts, the weeds in the foreground are from Endless Creations, and the leaves in the "non-oak!" 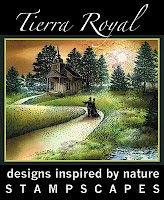 tree are from Rubberstamp Tapestry. 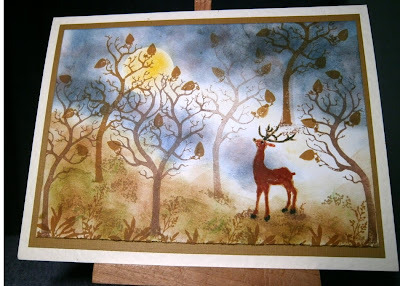 I used sponging for the background, and markers for the fawn and tree. Thank you ladies for all your beautiful work. These ladies do not have a blogs so you may leave your comments here for them to enjoy. See you on Sunday with our winners and top three. beautiful scene have you both made! I like the stamps that you have used, especially the tree root, and that the plant is climbing round the tree. beautiful window-looking trough the trees. 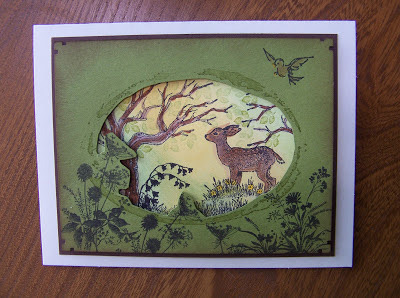 the first card is amzing with that deer! beautiful scene. great colouring! the second card with that little fawn so nice, the scene have so tiny-charisma, fits very well by that fawn. in comparison with the first scene, then you have that big deer with that wide area. beautiful contrast between the cards.